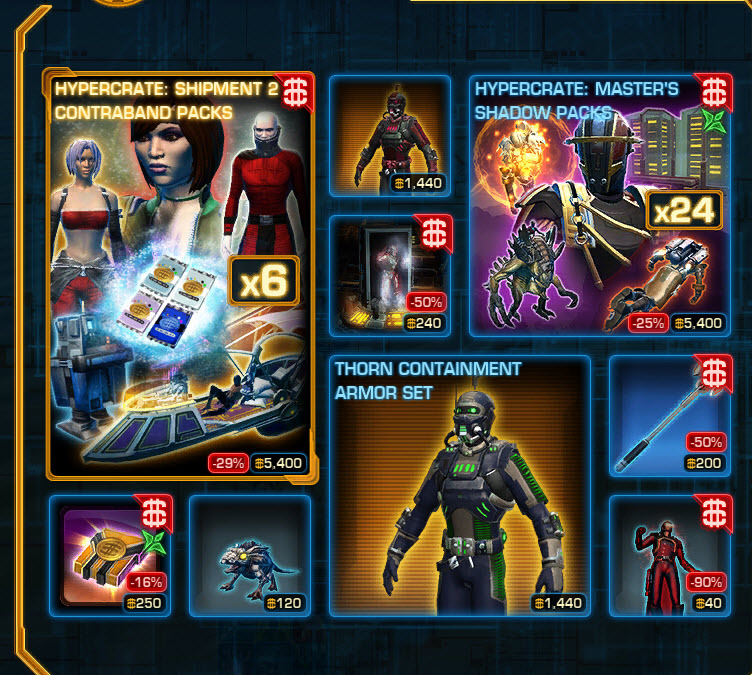 SWTOR Cartel Market Update for the week of April 7-14. To keep the items rare. At least we can get some items that disappeared from gtn ages ago to complete those old armor sets. I’m thankful anyways. It’s to allow people to fill the GTN back up with unopened packs. But if they allowed people to buy them individually, then the amount of people that bought them would be significantly higher, and the rarity of the packs would drop. As it is, they’re intend to bring the packs back while keeping them still somewhat rare and valuable. It’s manipulative I suppose, but it works. I thought the same thing at first but really what they mean by x6 is that you’re getting 6 of each pack within the shipment which adds up to 24 packs total. Still, poor advertising in my opinion. I don’t understand why the Corsec Electrobaton’s blades can’t change color according to the crystal you put in them, but there you go. So all the individual hair packs are still on sale? Cool. Not the Elvis one ! Lame, I was going to roll an Elvis toon for double xp. Everybody has got to have one. Still thinking which outfit will match this style better. Write down if you have any suggestion. I just checked and the pompadour is still on sale. All of the individual hair has been 100 cc since last week. I am still waiting for the white/white dye to make a comeback in the store. I’m going to have to sleep on the carbonite chamber I have wanted one for awhile. I wonder why they didn’t put the Thorn gear and pet on sale last week. Because they’re jackasses, same reason Gree stuff was on sale the week after the event. No white/white until they sold 3 mio pink dyes… I think that’s their strategy. Lol, a thorn set, bwahahaha! What about the Pink mounts that we all want when they are coming up ? When will Black/Black dye be around again? When are the Harley style mount going to show up ? Everybody seems to want one.